Facebook’s New ‘Promote Your Status Update’ Feature! We read about it, but then today we stumbled on it on our brand page. The Facebook’s ‘Promote’ feature that has been introduced to your status updates. 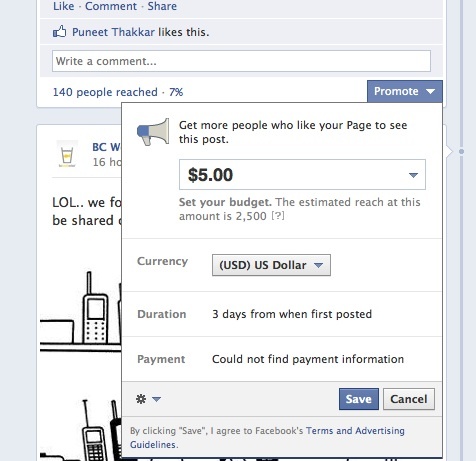 For as less as USD 5 you can have your status update reach out to as many as 2500 Facebook users! The feature is similar to Promote a Tweet, only here seems to work quick and fast with the click and buy views model built in to the status update bar. The feature is sure to bring in newer types of advertisers into Facebook folds, individuals, smaller companies and even large brands with big campaigns who want to quickly reach out with an update to a larger audience rather than get into a complete campaign management program with sponsored stories, premium ads or buying Facebook fans/likes. Our thumbs to this new feature from Facebook that allows specific messaging (your latest wall posts or status updates) to reach out to a larger audience than an average status update would, and also for the user friendly and simple mechanics. Would be good to see Facebook add features such as targeting to the Promote tool.